Did you happen to catch one of my two classes at SQL Saturday? My topic (which I love to speak about)… But I want it in Excel? SQL Saturday 379 was on June 13, 2015 at Nova Southeastern University, in Davie, Florida. It is always an honor to speak at my Alma Mater (graduating in 2005 with a Masters in Management Information Systems) and SQL with Excel is one of my favorite topics. I am always amazed that there are so many SQL experts that are not familiar with one of the easiest… and already PAID FOR… tools for accessing SQL data. Of course, I mean Excel. Many companies spend tens of thousands of dollars on expensive tools, and they really have the best solution in their back pocket! How many times has IT developed a great business system, some beautiful reports and then hear from the CFO…”Looks great, But I want it in Excel“? Users are often uncomfortable or resistant to using some sophisticated tools, maybe because they are hard to use, or maybe just because they hate change. They will often look at the computer guys like the proverbial Deer in the Headlights, tell us it looks great then say “But I want it in Excel“. I am not saying Excel is the best tool ever for creating great Business Intelligence Reporting Systems… but I will say it gets used! Isn’t that what is really important? I’m not looking to build a museum piece Lamborghini with reporting, but something that’s taken out of the garage and driven every day… my clients have work to do! The techniques for using Excel to access SQL is fairly simple, too All it takes is a data connection to SQL or any ODBC compliant database. 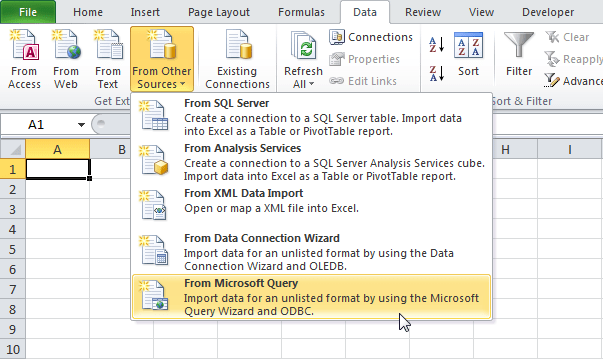 Once connected, you can pull all of the data using MS Query right into an Excel table. From there, you have Pivot Tables and graphs for making some beautiful reports. To all the students that enjoyed the class… thank you!